I seriously can’t get enough of tomato season. My favorite tomatoes so far are the dry-farmed tomatoes from Tomatero Organic Farms in Aptos, CA. (They are by far my favorite vendor at the Alemany Farmer’s Market in San Francisco, not just for their amazing tomatoes, but also because of their wonderfully flavorful strawberries and beautiful leafy greens…and their radishes….I could go on and on!) Jules and I bought a bag of tomatoes a week or so ago and we couldn’t eat them fast enough, so I threw a few into the Vitamix and voila, the best fresh tomato purée you’ve ever had in your LIFE. But I digress. 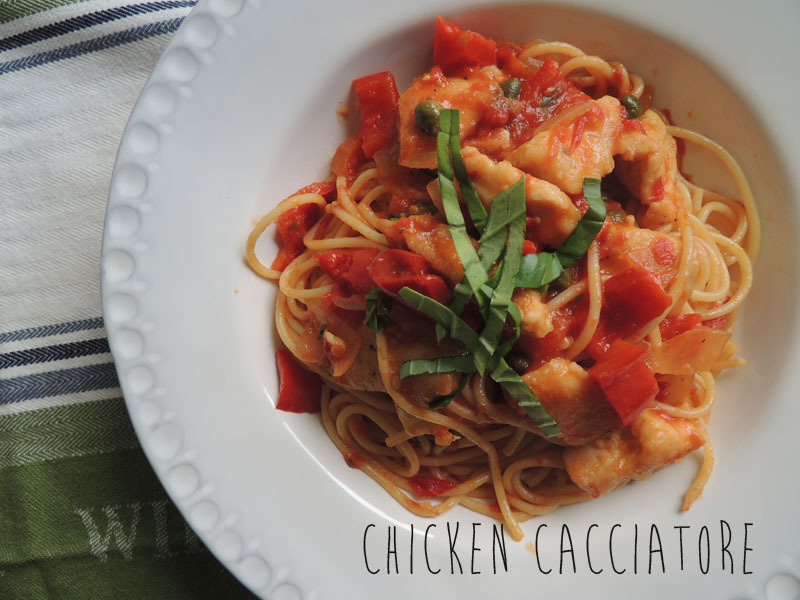 Here a pretty simple version of my chicken cacciatore – most people use whole pieces of chicken, but I prefer to have my chicken in small pieces because it cooks faster and is easier to eat. Also, if you don’t like/have capers, you can also put in pitted olives, but in our house, we love capers so we would even add more than the listed amount! Season your cubed chicken breast with salt and pepper, and then dust in flour. In a Dutch oven (or similar pot), brown the chicken in olive oil on medium-high heat and set aside. In the same pot, saute the onion, garlic, and bell pepper for a few minutes, until the onion is translucent. Deglaze the pan with the wine, then lower the heat and let it simmer and reduce a little, about 5 minutes. Add the tomato puree and stir in about half the water. Add the chicken pieces back to the sauce, along with the bay leaf, oregano, and capers (or olives), and season with salt and pepper. Give the entire thing a stir to make sure all of the meat is coated, then turn heat to low, cover, and let simmer for about 15 minutes. About halfway through, check to make sure the sauce isn’t too thick (if it is, just add a little more water), give it another stir, and then cover until time is up. Like any good stew, you can even let this simmer longer (just keep checking the level of liquid in the pot). It will make your entire house smell like an Italian family dinner, trust me. At the last moment, stir in some fresh basil and also save a little to top off when you plate up the dish (see below). 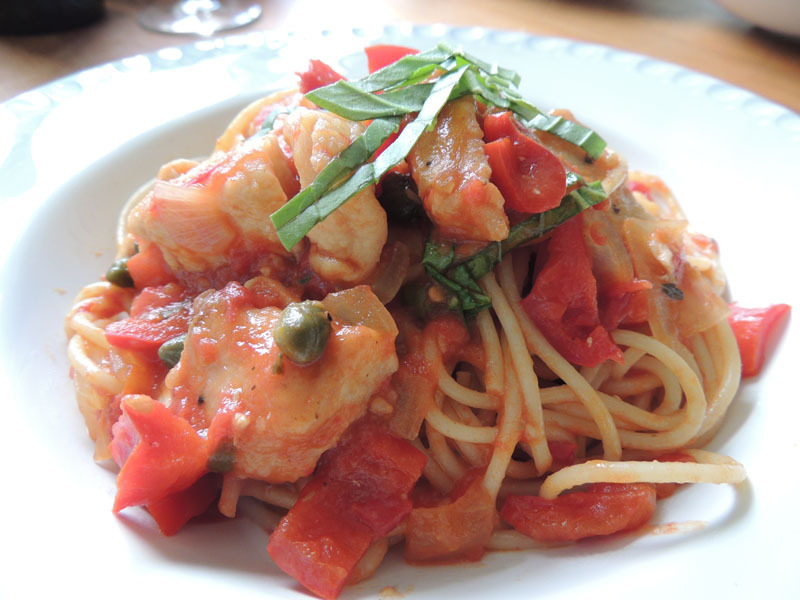 I serve the cacciatore on top of a big pile of spaghetti – but you can eat it by itself (no carbs! ), with rice, or on top of your preferred pasta shape.